Enjoy fun facts and ⓑⓛⓞⓖ excerpts about design, 3D printing, iconic books, things we love, and anything that inspires us! 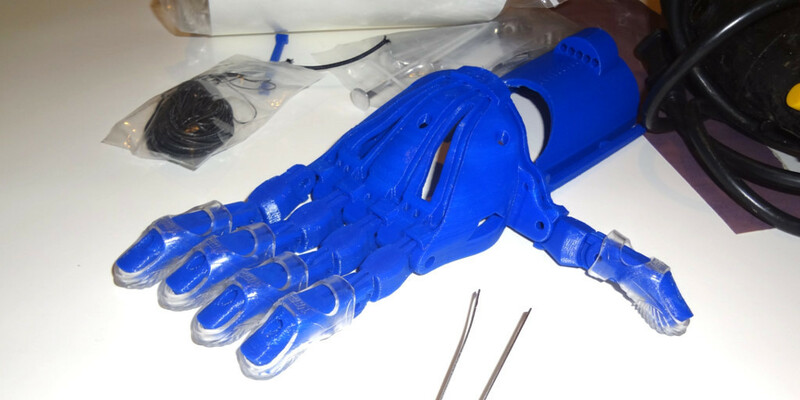 Learn more about Enabling the Future, 'A Global Network of Passionate Volunteers using 3D Printing to Give the World A "Helping Hand". There are many companies that manufacturer filament in the world, but not all filament is created equally. Filament diameters and composition consistency can differ from what’s listed on the product site. If you purchased filament that does not arrive in a vacuum sealed bag or zipped storage bag with dessicants, return the product immediately! Improperly stored filament predicates over-exposure to moisture and dust collection. I've tried various filament brands for my own FDM 3D printers and for other company's printers. To ensure filament composition is not the root cause of a print error, these are the only brands I personally recommend: Hatchbox, Proto-Pasta, Ultimaker, ColorFabb and to some extent Makerbot. If you are looking to buy used or opened filament on eBay, please ask the seller how the filament is stored. Although I have warmed improperly stored filament in a toaster oven, it is not worth the time and effort saving a little money only to purchase inconsistent, moisture-ridden filament. Have you tried Hatchbox UV PLA color changing photochromatic filament? It's an excellent idea to incorporate the UV photosensitivity for student learning, STEM sessions and teen makerspaces. 3D Print and then go outside for some solar education (weather permitting)! Dynamo for Tinkercad? Blockly for Tinkercad? Visual Programming for Children! I volunteer occasionally with young student organizations and makerspaces for 3D printing tutorials. I personally don’t like the move control in Tinkercad; but otherwise, the software has a simple and vibrant interface for children learning to 3D model. Although it would be nice to teach Rhino in STEM sessions rather than Tinkercad, most educational facilities (geared to children) will not pay for programs (or install 90 day version downloads that expire without use of the export STL feature) when Sketchup and Tinkercad are both permanently free to use for non-commercial means. So I've been playing with Tinkercad. MYTH: As man began exploring aesthetics, surfaces appeared on earth. Surfaces are generally recognized by the explicit modifications of the outward, exterior appearance. Excessive detailing of the exterior has been often scrutinized in the architectural world as superficial decoration. According to the most current Merriam-Webster dictionary, any upper region or boundary encircling an object defines a surface. This (all) inclusive definition serves two primary purposes: (1) by generalizing as a boundary, surfaces become privy to overarching classification systems and reduced to neutral architectural elements - isolated as objects; (2) by exposing as a boundary, surfaces are limited by their exteriority. What's YOUR favorite design surface? It's graduation season; and time for investing in careers and futures. Gifting stocks may sound like fuzzy logic, but owning a share in Autodesk or Adobe will only increase in value over time. For those unaware of the design industry, Autodesk owns a monopoly on design software and - like Adobe - uses subscription based annual licenses. So what does that mean to the everyday layman? Autodesk software is expensive but necessary. Construction personnel - be it manufacturers, consultants, architects, contractors or builders - typically will own at least ONE annual license to at least ONE of many Autodesk software subscriptions. **At the time of this post, Autodesk closed at $57.79 and Adobe was valued at 98.07. See what ADSK and ADBE are worth now. Is the 3D Printing Craze Over? Owning a 3D Printer has become a short-lived fad for many hobbyists, but not for designers. Owning a 3D Printer is a great idea for those skilled in 3D modeling. Just make sure you act with due diligence and research the printer technology first, especially the limitations of the print resolution and any maintenance requirements. Fused Filament Fabrication printers (FDM /FFF) are the most inexpensive type and require a bit of maintenance, especially for 3D Print newbies. Parts and proprietary filament add to the cost. Want our suggestions, send us a shoutout!